Students Cristian Candia and Víctor Landaeta work in this publication about the project “Digital games platform for the measurement of prosocial dispositions in school life”. They are part of a multidisclipinary team that is developing a new way to understand school climate and the cooperation given between students. High-quality school climate is advantageous for all students and may be particularly beneficial for at-risk students. It also shapes and informs daily experiences for students, educators, staff, administrators, and visitors. If we can understand it, we could predict bullying and improve academic performance. Social learning has shown that people are more likely to copy behaviors from those who are more successful (Heinrich, 2001; Pentland, 2013). As a consequence, the repeated success of an individual in a given task results in a favorable position in the social network for him/her. Two mechanisms to reach success inside of a group have been proposed by Heinrich, those are prestige and dominance. Prestige has been associated with positive attributes, and a status position is achieved by merits and/or talents without the use of violence. 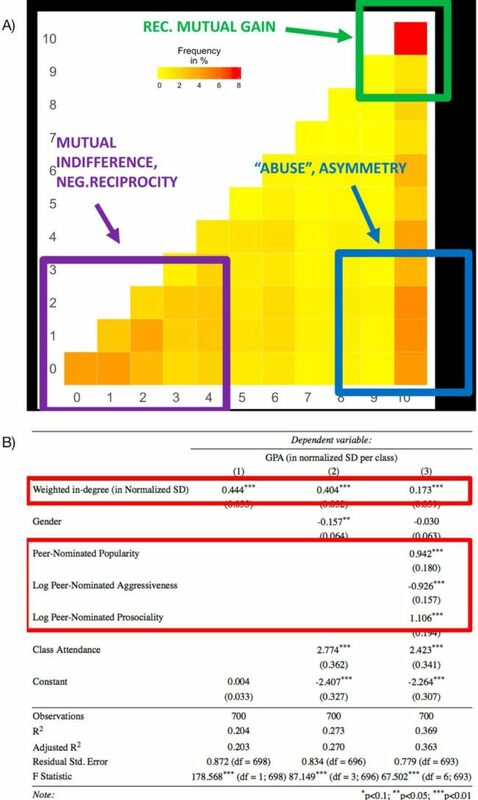 On the other hand, dominance has been associated with negative attributes, and the status position is achieved by this mechanisms is because of the use of violence against others (Heinrich, 2001). Experiments and data-based studies have been conducted on many different systems to probe how people learn from others (Heinrich, 2001; Pentland, 2013; Heinrich, 2015). However, the elementary classroom environment has been understudied, because of the lack of a proper instrument to arise good quality data and the lack of proper methods to conduct experiments. Our proposal pretends to give a new tool to get experimental data from classrooms, combining both, new technologies –which are able to capture the attention of a child in a more natural way e.g. video games, and experimental game theory, –which provide us a formal framework to capture revelated preferences of the child. Using this, we create a video game based on game theory (video-game theory), that allow us to study school classroom environment, by controlled social dilemma experiments, whose results can be contrasted against real-life indicators of school-life. Focusing on the first cycle of primary school attending public schools, the aim of this project is to study the relationship between the student individual social capital within her/his class, and her/his academic performance, and her/his social co-existence. Central to our approach, we assume that each classroom remains in a long-term steady state, so we consider the pre-existing social network at the classroom, where nodes represent the students and ties represent the cooperative relationship between them, as a proxy of social capital (Burt, 2000). In order to elicit this network and measure the social capital embodied directly in the agent’s relationships and indirectly by the configuration of the network as a whole (Lakon et al, 2008), we use experimental game theory. We specifically implement a non-anonymous dyadic experiment, characterized by potential mutual gains which are threatened by individual opportunistic incentives i.e. the dyads members face a social dilemma game. During the experiment, all possible pairs combinations within the class have the opportunity to play the game. Therefore, a “complete” weighted mutual support (or reciprocity) network is elicited. This network gives us information about the state of the social relationship between children. The resulting network structure, based on cooperative relationships, is able to capture different properties of the classroom related to academic performance and social co-existence. First, we find a positive and statistically significant relationship between network centrality –measured as the sum of the outcome on the (video) game,– and student’s academic performance –measured as GPA, even controlling for others socio-behavioral characteristics that are correlated with GPA. Second, we find that positions in the social network have a significant power to identify, in an early stage, a child who is susceptible to be victims of bullying, and child who have a high probability to be bullies. These results not just help us to understand the elementary school environment, but also open new avenues for the role of networks in the education system, with a huge potential impact in education public policy, these results are useful inputs for decision makers and physiologist to prevent bullying and improve learning. Log in | 68 queries. 0.250 seconds.